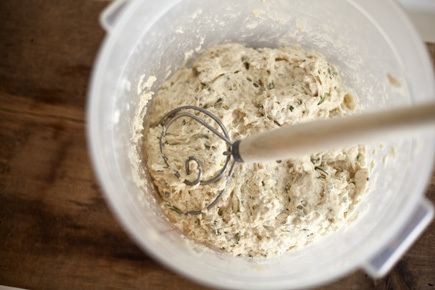 Add up to a 1/2 cup of your favorite fresh herbs (use much less if they are dried), to the Master Recipe, Peasant Bread or even Brioche from any of our The New Artisan Bread in Five Minutes a Day books. 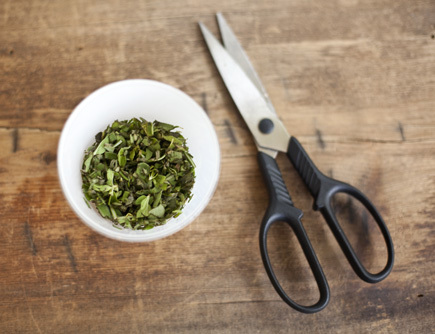 snip them with a pair of Kitchen Shears. It eliminates having to clean a cutting board and keeps them from scooting onto the floor as you chop. Mix them into your favorite breadin5 recipe. 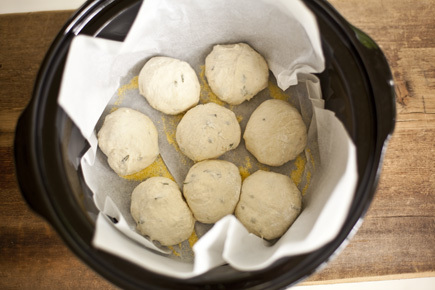 Once the dough has risen, you can use it right away or refrigerate it and use it over the next couple of weeks. 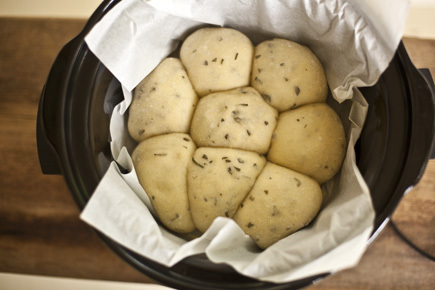 Divide 1 pound of dough into 8 equal pieces and form them into balls. Place them into the prepared crock-pot. Once the buns have set, check by gently poking the top, they should no longer feel like wet dough, but will not be crusty. If you want a crustier bun, with nice color, you can brush them with olive oil or butter and set them on a sheet pan under a broiler until the color you desire. Be sure to keep a close eye on them so they don’t burn. WOW!! Love your recipes and now this?? This makes me wanna make bread in 100 degree weather! Thanks!! I think I see a Crockpot Bread in 5 cookbook in our future!!! It will make a great loaf bread. You will want to fill it about 2/3 full, let it rise for about 90 minutes and bake it for about 50 minutes. Thank-you for getting back to me Zoe. One more question. About how much dough will I be pulling out of the container to get that 2/3rds. Thank-you again. It will be about the size of a cantaloupe or 2 pounds for a 4 1/2 x 8 1/2-inch loaf pan. I’ve been baking in a dutch oven on the grill thanks to one of your posts and very happy about it. With the heat outside, my house wouldn’t have survived a hot oven. My last experiment was to replace 50% of whole wheat flour in your 100% whole wheat recipe with kamut flour. The bread turned out small,heavy, and too dry. I’ll try to add more water next time. Have you ever tried kamut flour? I would appreciate your advice. I haven’t used it in our recipes, but imagine that it behaves much like spelt. It probably doesn’t have the same gluten strength of whole wheat and you may consider using some vital wheat gluten in your dough. This will give the dough more structure and ability to rise. You will want to add about 1/4 to the whole recipe and increase the water as well. For some reason the dough won’t rise. I am using refrigerated dough that is less than a week old. During the hour and 40 min rest time the dough rises slightly so I usually shoot for 2 and a half hours. When I put the dough in the oven it fails to rise further, there is slight variation in oven temp but it stays within about 20 degrees of 450. I do not use a baking stone. I know that the dough will rise because when I use the same batch to make a free form loaf and the baguette the loaf rises just fine. Also I am using a glass loaf pan. I have to say that I am a bit stumped, it should rise just as well in a loaf pan. The Master recipe tends to rise quite well because it is made with all-purpose flour. Is the room that you are rising it in colder or warmer than usual? If so, it will effect the resting times. Thanks, any more details you can give may help us get to the bottom of this. I am not exactly sure of the room temp but after taking out my loaf that did not rise (it made really good french toast sticks) I prepared another loaf, in a metal pan, and due to time constraints I could not bake it. I let it sit overnight in the fridge and it rose. Could it be that it just needs more time? If you have any specific questions I would be happy to try and find out the answers. I am glad to hear you had success with the refrigerator rise. For whatever reason, maybe your room or the refrigerator is running a bit cold, and it just took longer to rise. 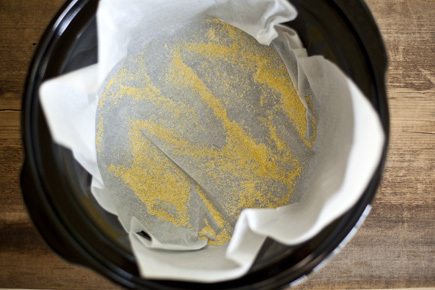 For crock-pot baking, is there a reusable alternative to the parchment paper? Some people have just put cornmeal in the pot and baked the loaf directly on that. I have yet to try it, but they have reported success. 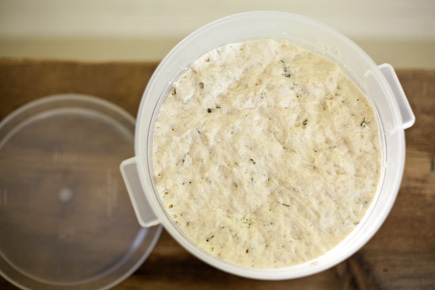 Is there any way to add the herbs to dough you already have in the frig or do you need to make the dough with the herbs from the beginning, committing yourself to herbed bread for that batch? 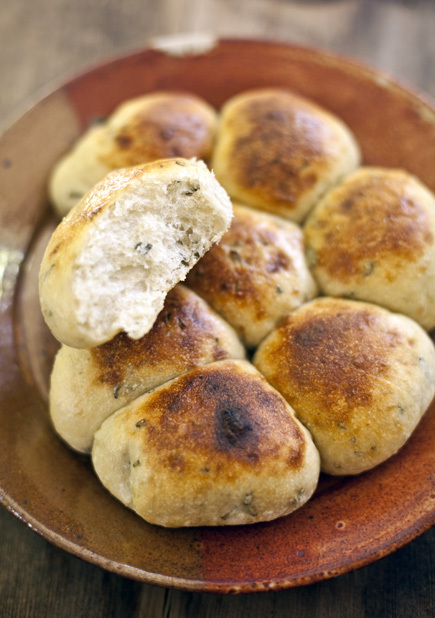 You can roll out a piece of dough, sprinkle it with the herbs and then roll it back up to form a ball or bake it as a loaf pan bread. Thanks – can’t wait to try it. For Bran-Enriched White Bread (PG. 72, Artisan Bread in 5 Min a Day), can I use oat bran in place of the wheat bran? If so, do I need to adjust the measurements? Yes, you can substitute the oat bran for the wheat bran, it measures the same. I just want to thank you for putting out such great books for the world to enjoy. What a lovely note. We are so glad you are enjoying the bread! I am getting ready to try the dough in the crock pot. You don’t say whether to put the lid on the crockpot, so I assume you do? Thanks, love your books, your bread and your website! Yes, you need to cover the loaf to recreate the effects of the oven. Thanks for these great recipes! I can’t tell you how many compliments I have gotten on the bread I make with your recipes and each time I serve it or give it away, friends are asking for the recipe. I love telling them how easy it is! My kids love to bake with the dough, too, and create their own loaves (which are usually very uniquely shaped!). Great recipes. I have the first two books and can’t wait to get third one! Thanks! Thank you for trying the recipes and for spreading the word! I am making the 10 grain bread into a loaf for sandwiches, should I lower the oven temp from 450 to 350 to get a softer crust. Thank you. Yes, that will result in a softer crust, but you will have to bake it for a longer time as well. Oooh, so glad I found this!! I can’t wait to try this soon!! How can I get a browner, more crispy crust without over baking the bread? Are you using an oven thermometer, sometimes it is a matter of the oven being too cool. You can also try the Dutch Oven method, which produces a great crust and crumb. Or, you can put it on the top rack for the last few minutes of baking, where the heat is more intense. I just took the herb crock pot rolls out of the Toaster Oven. I mixed the herbs into cold master recipe(white) and baked in my crock pot for 11/2 hours. Then I transferred the rolls to a pizza pan and brushed them with soft butter and browned them under the broiler in a toaster/convection oven. They smell and look lovely and are going to make great little sandwiches for lunch and the kitchen is still cool. Thanks for continuing to innovate and coming up with new things to do with the wonderful doughs. I also have a pain de mie pan of dough rising. I have tried three different doughs resulting in successful sandwich loaves. I am thrilled that you tried these and I love that you were able to finish them in your toaster oven! A nice thought but I use my crockpot for fixing and storing the dough! Wishing I had seen this when you posted it! I’ve been waiting until the heat and humidity broke in southeastern PA before trying my first Artisan Bread in 5. 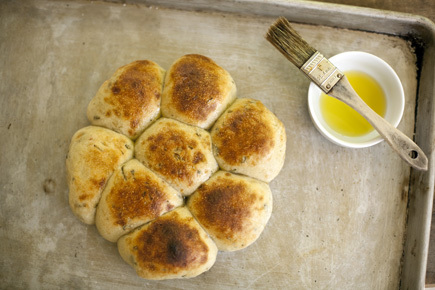 To think my family and I could have been feasting on delicious homemade bread weeks ago without baking ourselves, too! My first two traditional loaves came out beautifully, but I will save this slow-cooker version for the next heat wave or when my oven is otherwise occupied. Thank you! well, we’ll see you again next summer, I’m sure! Baking the dough “dry” in a crockpot will it crack the ceramic pot? Thanks. Kathryn: Check with your crock-pot’s manufacturer before trying this method, since some model’s instructions specify that the pot has to be at least partially filled with liquid to avoid safety or durability problems. And never bake in a crock-pot unattended. Parchment paper is impregnated with silicone and I avoid it. What else could I use? Nede: You can try to just skip it– some readers have. Use cornmeal under the loaf, or just dust really well with flour or it might stick to the bottom of the crockpot. Can you tell me if whole wheat white flour works well for your basic bread dough? I was thinking of using it in your Master recipe or peasant bread dough. OK– that won’t work too well, it’ll be too dense and the dough will be too dry. WW or WWW take more water, and to our taste, don’t store well without vital wheat gluten in the mix. Do you have our 2nd book that gets into that? I don’t have your books yet, just found your website yesterday and got very excited. We are trying to eat mostly whole grains so all of my homemade breads and pastas lately I have made with whole wheat flour 1/2 and 1/2 with white. Christy: If you keep the WG to 50%, you can actually get away without the VWG. But you do need to increase the water. 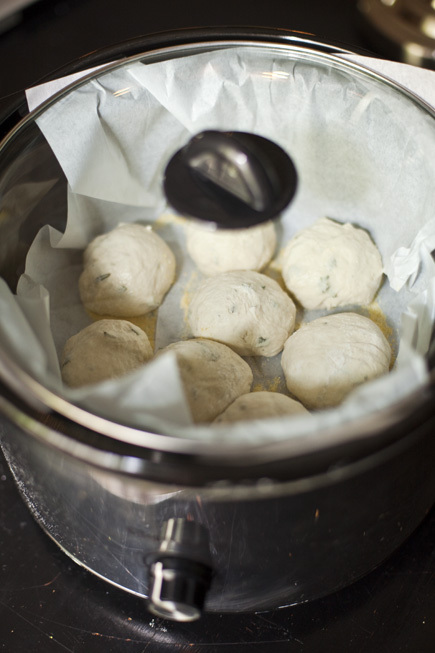 I just made my first batch of boule dough last night and I found this blog post today. 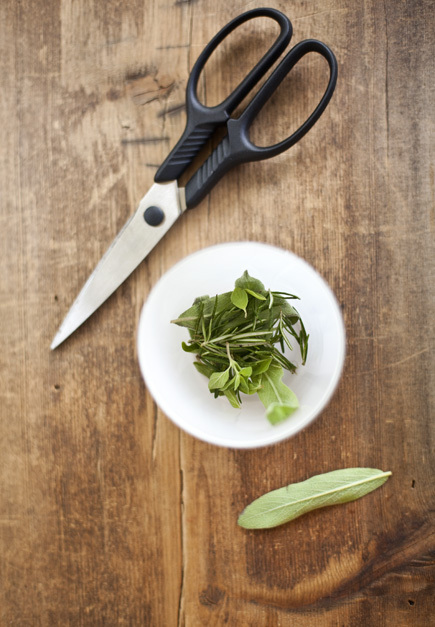 Is there any way I could mix some fresh herbs in right now or would that not work? I have some rosemary and thyme leftover from making homemade pizza this week and would love to throw it in! Hi! I am anxious to try this recipe, but wondered if I could somehow make this in conjunction with pot roast in the crock pot. I am wondering if I can make the pot roast leaving enough room to set a cake pan down into the top of the crock pot for the last hour. Any ideas? This is such an interesting question and one I am not 100% sure about. I suspect that there would be too much moisture in the pot for the bread to bake well, it would be more like a steamed pudding in texture. But, the ingredients for one of our loaves is about 45 cents, so I think it is worth a try! Please, if you try it, will you come back and let me know how it goes? Usually you can skip the resting period with crockpot because of the slow preheat, but yes… you may get better rise with by resting in advance. Hi There. Your recipe and beautiful pictures inspired me to try baking in my crock pot. I didn’t have parchment paper so I placed my dough in a brown paper bag. I finished it in the oven. Came out great but I have a hard time removing the paper. Tomorrow another try with parchment paper. Yeah, that parchment has a coating that allows it to pull of pretty much anything– see what you think. When making buns in the crockpot, do you let them rise after forming the balls or do you cook them directly without allowing them to rise first? Crock pots heat slowly so you don’t need to pre-rise things– the rise is built into the bake. I read through all the comments above and am not quite sure if I can bake an artisan loaf instead of rolls in the crock pot. I have been making the whole wheat loaf from HBin5 about every other day but have been dreading turning the oven on in the summer. Since it has been in the 60’s here in Albuquerque the last few days, I need to plan for the heat that is coming. If a 1 lb. loaf will work, how long should I cook it and should the crock pot be set to low or high? Thanks for your help. I would really love to try this recipe. Can you please tell me what brand of crockpot that you use to bake the rolls and bread in? I can’t find any info on the crockpot that I presently use. Thanks so much! We tested mostly with a (very old) Chefmate brand. We don’t even know for sure that it’s still made. Testers reported that modern ones worked similarly– you’ll have to just experiment with the one you have. Love the website and books! Just wondering – do you need to let the rolls cool before serving, or can they be served warm from the crockpot? Skinny or small breads can be served warm. Loaves, especially when made with our wet dough, can seem underbaked or gummy when served hot. Even for rolls/baguettes I’d let them cool a little while. I’d love to make these in my oven 2 – 3 days in advance for Thanksgiving and then just bring to room temp on Thanksgiving, then pop them in the oven to reheat while turkey is resting. Can I just place the proved dough in a round cake pan w/ corn meal on bottom? Or just place them on parchment on my stone? What temperature and for how long in the oven? If possible I’d like to bake these by Monday prior to Thanksgiving. Thanks. They sound lovely. Parchment on the bottom of the pan will be more fail-safe. otherwise might stick. Same temp and time as usual recipe. Hi – we LOVE all of your bread & just found out that my son has to be gluten free. I’ve had great luck with your recipes — thank you!!! – would the crockpot teqnique work with gf? Yep–it’s on page 88 of our Gluten Free book (on Amazon at http://amzn.to/1msOBmY).